Timber Wolf Ti-Coated Rainbow Pocket Knife | BUDK.com - Knives & Swords At The Lowest Prices! 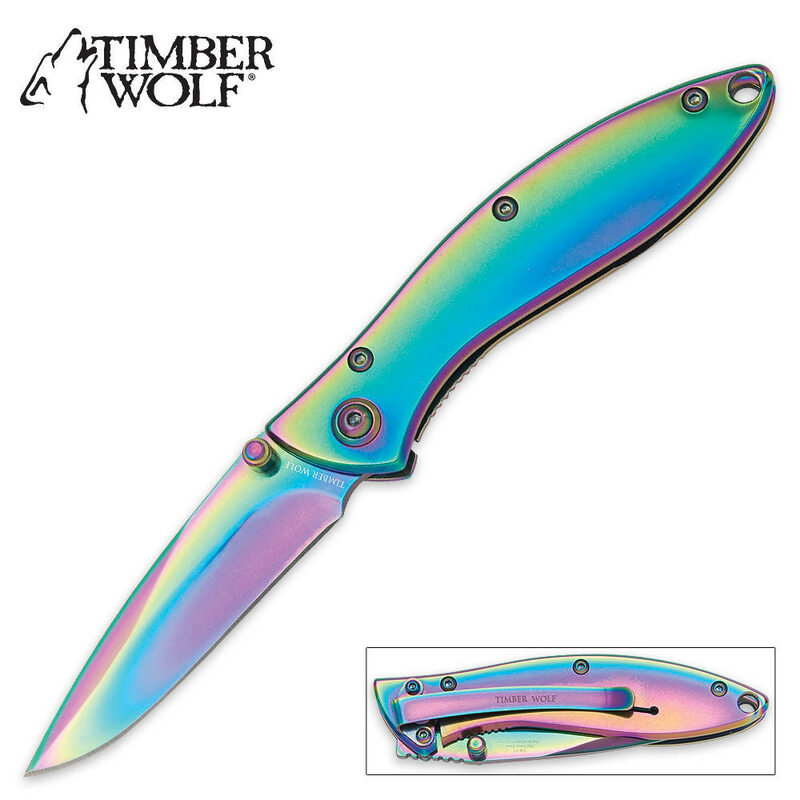 Timber Wolf's new Ti-Coated Rainbow Pocket Knife is sleek, stylish, and sharp! It features a solid stainless steel construction with an all-over anodized rainbow finish. 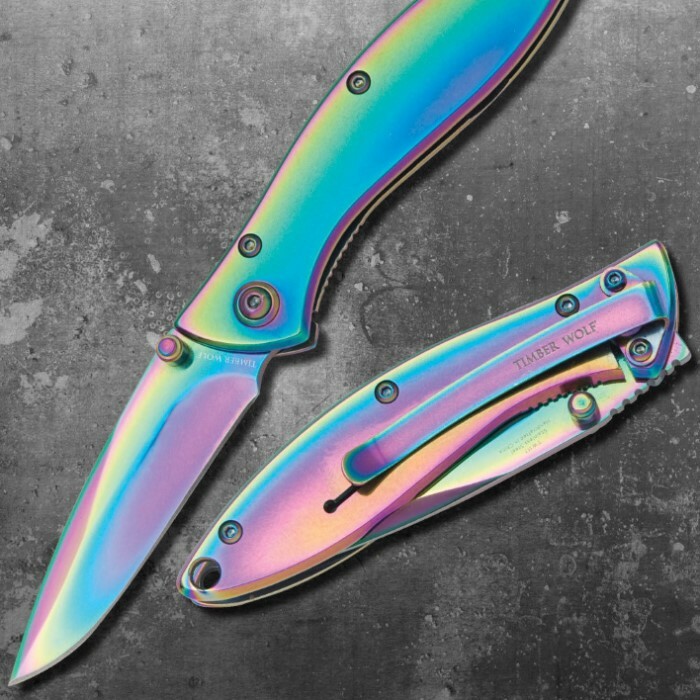 The razor-sharp 420 stainless steel blade is striking with its rainbow finish. A framelock secures the blade safely in the open position and the knife has a pocket clip. This pocket knife has the real "Wow" factor you've been looking for! I had a similar knife in the past, of course don't know where it is anymore. This one fits its absence perfectly. I also like that it doesn't have an assisted opening feature as with many knives these days; the thumb tab is more functional. This knife looks durable as well as pretty! This knife has served me well. I reviewed this knife before and gave it a bad review because one out of the two I ordered did not stay locked . It wasn't safe to use. I have since totally changed my mind. I have used the second knife so often I have sharpened half the blade away. I just bought two more and both lock correctly. This knife is about the same size and weight of the Ken Onion Leek I previously carried and it cost a LOT less. The thumb studs make it easy for women with long nails to open. I plan to order more so I am never without it. At this price it is well worth overlooking the occasional slip on quality control. First of all, any reviewers who say they bought this for self-defense are in for a world of hurt if they ever actually get into a fight, because this is just not a combat knife. If I ever get attacked and this is all I have to defend myself with, I'll be putting it back in my pocket and using my fists even though only one of them works right. Second, love the color. I recently got a rainbow knife for a friend who needed a good belt knife, and so this was a great way for me to have a nice little rainbow knife for myself at a reasonable price. I host a lot of formal events, and even though this will take up a little bit more space in a clutch purse than my old gerber, it's every bit as good and a heck of a lot prettier. Third, this is a fantastically made belt tool. I've been using belt knives and swiss army knives for every job under the sun since I was a kid and I love this thing. It's sturdy, it feels good in the hand (Though it could do with more of a slip guard near the base of the blade- this is the main reason why I say it's not a defensive knife, but not the only one. ), and it just looks so good. Really an ideal lady's tool. As a lefty I find that the belt clip gets in the way of the thumb screw a little bit when trying to open it and of course having one hand messed up makes two handed opening a pain, but that's a consistent problem for me so I don't take points off for that. I'm confident that I'll get better at one-hand opening with practice. It's not my first Timber Wolf knife, and it certainly won't be the last! Bought this knife for my daughter. Unbeatable blade for the price! I was impressed with the quality I got for the price. This knife is durable, sharp and reliable. It tackles my daily tasks with no problems at all and the rainbow finish always makes people ask where I got it from. Saw this online, promptly squealed like a girly girl and put it in my cart. I am totally satisfied with the look and quality, especially considering the price. Sturdy and even prettier in real life than the pictures online. I have no issues with the locking mechanism, blade, or clip. Excellent addition to my collection. I just have to say this is a extremely wonderful knife!! The color that it shows online is nothing compared to the way it looks once you receive it in the mail. It is beyond better then that is so vibrant and beautiful i am truly at a loss of words on it. Then the blade is extremely sharp out of the box and needs no sharpening at all and tried to cut bark of a branch of wood and it did that with ease as well!! There is nothing that I can say on it that is bad on the look and sharpness of the knife under any means, and I plan to for sure order a couple more for Christmas gifts for family and friends!!!!! This is a really nice to hold and use piece. It catches the eye as well and is very smooth in closing and opening. Makes a very good EDC. This is an affordable pattern, very well finished in color and catches the eye appeal with ease. A good EDC pattern that works very smoothly in opening or closing. Would recommend to anyone!! You just can't find a better value than the Timber Wolf knives. Good quality, and good looks.